- analog, digital & mixed-signal design when you need it! The share of scientific contributions originating from industry is diminishing while the overall number of papers increases rapidly. 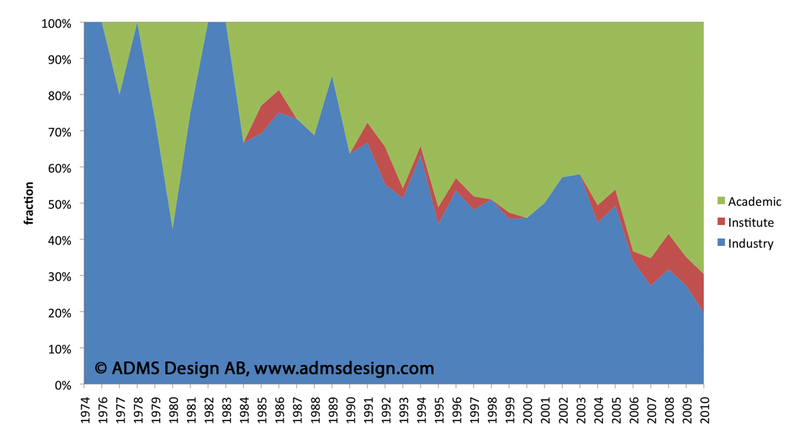 That is a persistent trend in the A/D-converter field according to an ongoing survey of research trends conducted by ADMS Design. “Analog-to-digital conversion has a central role in nearly all electronics today”, says Dr. Bengt Jonsson, founder of ADMS Design, “and it is not unlikely that similar trends exist in neighboring fields such as ASIC and RFIC”. Specifically, the study showed that the percentage of scientific publications where the first author is affiliated with a company reduces every year. The first author is usually the main contributor. The negative trend can be observed almost as far back as when the first monolithic implementations were reported in the 1970’s, and is approximately linear. Therefore, there will be no ADC-related industry research published scientifically by year 2020–2025 if the trend holds. The trend is not necessarily reflecting a reduced industrial research activity. It is partially explained by an annual growth in academic research output that results in a continuously shrinking share being from the industry. Increasing competition and secrecy, a mature field, and the abstract business value of scientific publications are other possible explanations. Reports with analysis results will be available for purchase after the summer. For more information, contact ADMS Design. The study has focused on scientific research where monolithic IC prototypes were fabricated and experimentally evaluated. Simulation-only, and purely theoretical works were not included.